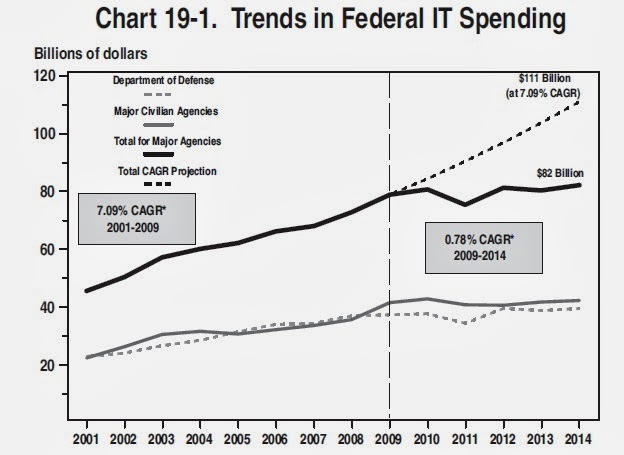 CONVERSABLE ECONOMIST: Should Federal IT Spending be Flat? In its latest proposed budget , the Obama administration praising itself for limiting the rise in information technology spending by the federal government. This seems peculiar. After all, a number of stories in the news suggest that some additional federal spending on information technology might be needed, like the the botched and halting roll-out of the health care exchanges in the Affordable Care and Patient Protection Act of 2009, or the rising concerns over cybersecurity, or difficulties for the IRS in handling information and payments. The Washington Post just published a "Sinkhole of Bureaucracy," by David Farenthold, which tells the eyebrow-raising story of how story of how 600 employees of the federal Office of Personnel Management work in an office that is set in an old Pennsylvania limestone mine outside of Pittsburgh, where they file retirement papers of governnment workers entirely by hand, 230 feet underground. The federal government has been making plans to computerize the operation since the late 1980s, but has not succeeded after a quarter-century of trying. More broadly, the federal government is at its heart an enormous information-generating and information-processing organization. Over the last few decades, information technology has progressed by leaps and bounds. It would seem plausible to me that the federal government should be a major consumer of this technology: after all, the private sector has used this technology to provide a wide range of services to consumers while also replacing large numbers of middle managers. The discussion of federal IT spending appears is in Chapter 19 of the Analytical Perspectives volume, released each year as a supplement to the budget proposals from the president. Here's Figure 19-1, in which the Obama budget folks choose to emphasize that IT spending rose by 7% annually during the Bush administration, but by less than 1% per year during the Obama administration. Some of the discussion in this chapter makes perfectly sensible points. Yes, you don't want every agency in the federal government running around with its own proprietary software packages that won't link up to others. Yes, it's useful to make some decisions about shared tools and platforms. Yes, it's always good to be on the lookout for the "duplicative" and the "underperforming" projects. "The interconnectedness of our digital world dictates that the Government buy, build and manage IT in a new way. Rapidly adopting innovative technologies, improving the efficiency and effectiveness of the Federal workforce through technology, and fostering a more participatory and citizen-centric Government are critical to providing the services that citizens expect from a 21st Century Government. ..."
"The President has identified the Cybersecurity threat as one of the most serious national security, public safety, and economic challenges we face as a nation. ..."
innovation across our Nation and improve the quality of services for Federal employees and the American people." I suppose one might argue that the capabilities of information are rising so quickly, and prices for IT are falling so rapidly, that the federal government will be able to achieve these kinds of IT goals even with no increase in spending. I'm writing myself a little mental note here: Whenever the federal government under runs into IT-related issues and problems, I'm going to wonder if the proud determination of the Obama administration to hold down IT spending was such a smart decision.